Ultimately, however, this eliminates 90% of Obj-C. Still need to use Obj-C (or Obj-C++) to use iPhone interface widgets. Don’t worry about it right now. The openFrameworks team did great work under the hood of version 006 to enable this. ofxiphone was compiled by Lee Byron, Memo Akten, Damian Stewart, Zach Gage, and the core OF team (Zach, Theo, and Arturo). Get the necessary software for development. You can then start a new project at File>New Project… then select Other in the left panel. Improved demo – based on the Touch+Accel demo in the examples folder. 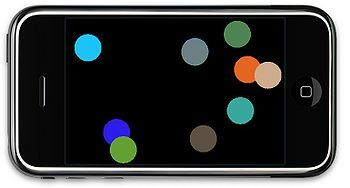 Can toss objects around screen. touchId is an identifier of which touch in the current set of multiple touches is currently being evaluated. The Thing class in the demo has an instance variable which stores this, so the object knows which touch it should be responding to. ofxAccelerometer.getForce() returns an ofPoint (x,y,z) of the current force. Change Default.png and Icon.png in the data folder. Modify testApp.h and testApp.cpp as necessary. Feel free to build out extra classes as your project needs them. Again, follow the instructions on the Portal. Device Provisioning. 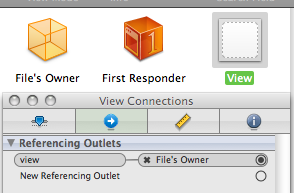 Drag the downloaded device provisioning file onto the Xcode Organizer. Download the above multitouch demo with a UIView added for preferences. 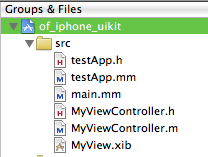 You can combine both C++ and Objective-C into one file. Change the file extension of main.cpp and testApp.cpp to .mm (as well as any other custom classes that include both). Important! 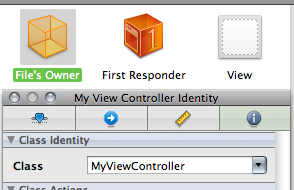 MyView.xib needs to be aware of it’s UIViewController, called MyViewController in the demo. This sounds a bit confusing, but is straightforward – follow along with the screenshots below. You can also add animated transitions and all the other UIKit goodies…but that’s for another day. You can use standard IBOutlet and IBAction objects to send signals between your view controls and program logic. That is outside of the scope of this overview. So is the Model-View-Controller (MVC) paradigm…but I’d create a singleton data object…and have your view controller and testApp classes access it…if I were you, and all. This entry was posted on Sunday, May 31st, 2009 at 11:13	and is filed under iphone. You can follow any responses to this entry through the RSS 2.0 feed. You can leave a response, or trackback from your own site. Please continue with the examples and info. Do you have any info or links/samples that deal with pausing and restoring an app? Not for ofxiphone specifically. I suppose that you could roll-your-own solution using ofxiPhoneFile to write out data when the app exits, then look for it in setup(). You could also use the SDK method (in Objective-C) with a plist for simple things, or archiving objects for a more complex system. Maybe if you are storing data in arrays in C++, then you could use a convenience method to convert it into an NSArray then use NSUserDefaults to save it to the standardUserDefaults. Of course, you’d have to convert it all back, maybe in setup() if you’re mixing c++ and obj-c in your app. I haven’t tried, but I’ll give this a good thinking and maybe see what I can find. I’m planning on going to the oF knitting circle in NYC tomorrow night so maybe I’ll be inspired to whip something up.